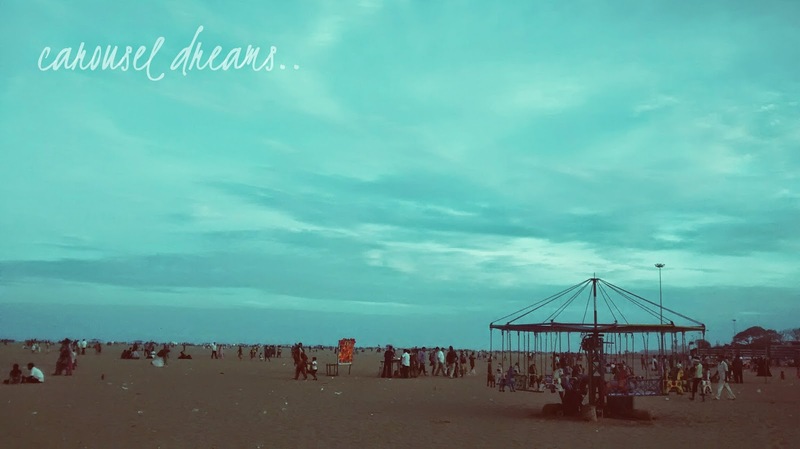 Dignified Repose..: Chennai, you incredible beauty. It was one of those days when I went a sort of weird mental. And that probably explains how I found myself aimlessly walking alone across the world’s second longest coastline. I kept looking back at the buildings and the road every second minute, and the sky kept astounding me with clouds that were changing shapes and shades so quick it looked like someone had ordered a cosmic multi-flavoured ice-gola, or a cloud-gola, rather. Blue, orange, pink, colours in between – the sky seemed to have it all. Almost instinctively, I took my phone out, clicking pictures, walking backwards into the beach, almost bumping into several couples from the rosy-phase land, immersed in deep conversations (or not). A bunch of crows seemed to be incessantly inclined in flying in a sort of a parabolic path. If you knew my history with high school mathematics, you would understand why I wanted to pat myself on the back for having even thought of a parabola then. Somewhere to my right, an empty carousel went around. I tried to come up with a good explanation as to why the sky to the right of the carousel looked all decked up while the one to the left stood plain and empty, with a streak or two of clouds there and here, like a hurried stroke of an artist’s brush. My phone battery beeped. It was out of charge. I switched the internet off, put it in my pocket, and walked over to somewhere near the water. I found myself a spot near enough and far away from the waves, took a deep breath, and started reading ‘The catcher in the rye’ from where I had left off earlier. I sat cross-legged first. Stretched them out after a while. Left my feet sink into the sand. Leaned into my bag on the right hand side. And then I reminded myself that I cannot be lying down flat, it just doesn’t work that way here. It started getting dark pretty soon. I had to keep craning left and right alternatively to find light from the ice-cream stands and the corn stands. I paused to look around for a minute. The lighted yoyos were zooming in and out everywhere. Bright red lighted horns shone around every five feet. I had always fancied buying one for myself. I reminded myself I needed whatever money I had to buy water or a bar of chocolate in case the water or glucose levels in my body decided to go haywire out of nowhere again. I got back to my book. Something fell on me, and I thought my heart had leaped out of me in fear. It was one of them lighted yoyos. The guy who sold them came walking to pick it up. Another group of guys walked past me. One of them remarked out aloud about how stupid my face and hair looked. A little kid that was just learning to walk came running towards me. The bigger sister, a couple of years older than the little one, came running behind and lifted the kid up from behind. ‘It’s okay, ma. Akka is here,’ she said. The guy who sold cheap wooden flutes walked right behind me for the fourth time. This time, he kept playing the first two lines of one of my favourite songs, which I fail to remember now. It bothered me. Why couldn’t he just go to the next line? He was playing it very beautifully, anyway. The fifth time, I turned around out of annoyance. His huge stack of flutes that pointed around from the stack he had arranged on a singular stick stood beautifully silhouetted with a backlight that shone from one of the vendors’ shops. The colourful lights far away from the shore stretched on either side of him. My mind was quickly calculating ISO and aperture levels. When had I become this? The book was picking up good pace, and I had a couple of chapters left, but I thought it best not to alarm Amma with a switched off phone. I got up, walked closer to the water. Distant lights blinked from across the waters. This one thought always surfaces my mind when I stand that close to the waves. The ones that make the loudest sound, making you wonder if they will take you back with them spiral in and fall flat far away. It is that sly one that will take you by surprise and leave your pants all salty and sticky. Sometimes, it digs a nice little hole for your legs. I have developed a fancy for the way the waves retreat and the patterns they leave on the sand. I wonder if anyone else ever sees that. The water makes me feel infinite. I could have stood there like that for hours. My phone battery beeped again. I made a move. I was almost bumping into a lot of couples again, what with the light being on the opposite direction, and my sight anywhere but what was immediately in front of me. I took my phone out to check the time, and helplessly snuck at peak at a few of the pictures I had taken on it earlier in the evening. Let me tell you, psychotic heat waves and everything said, there is something always incredibly beautiful about this city. P.S: After catching barely an hour’s sleep in the night, I woke up to the news of the bomb blast at the central station. Everything I had read up and written about terrorism for my research paper was coming back to me in one hard blow. I was disturbed for hours together. The news channels were warning people against venturing out to crowded places. My paper reminded me that that was the ultimate goal of terrorism, not the destruction in the bombings themselves, but the perennial, viral fear that sets in the heads of people, gnawing away every other thought or emotion. I remembered the conclusion I had written for my research paper one 3 a.m. How distant the concept seemed then, and how alive and real, and scary it is now. ‘Great man’ Dumbledore said nothing can bring back the dead. But let’s stick by each other, yeah? And let them not get the better of us. Everyone’s struggling with a battle of their own. Just be kind to one another. It’s not just Chennai’s weather that is perpetually warm, but her heart as well. Love your style on this! Indeed, there is something beautiful about this city.